An acquaintance that is building a Ford LLM engine in their shop recently told me . 95% of the cars i have ever been involved with have been GMs but i always admired the guys that tried something different . 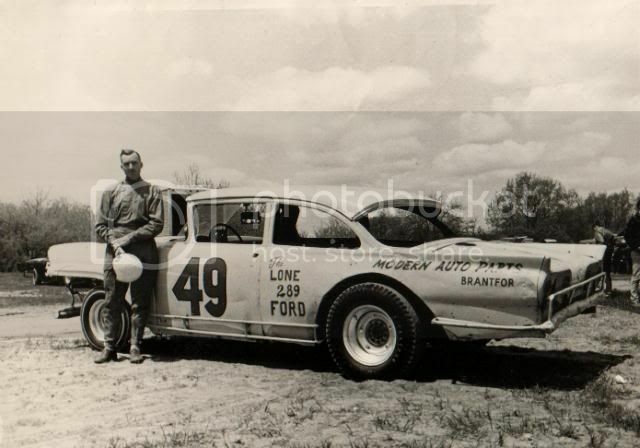 Anyone that has a pic of a non Chev stock car (not a mini stock) please post it here . If their is a more successful non Chev stock car in Canada then Berrnie Reddick and Howie Scannell i don't know who they are . 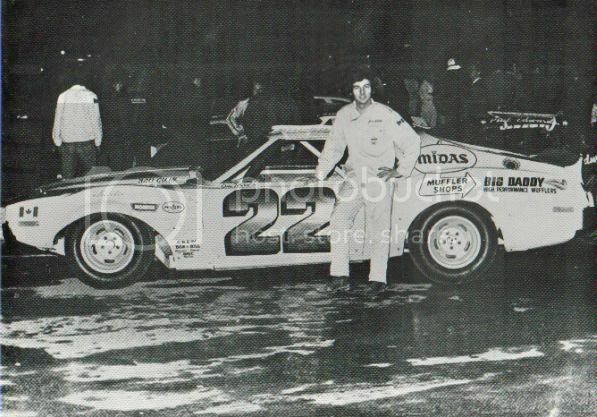 Jim Ward no relation to the chassis builder had one the cleanest AMC race cars i ever saw . Unfortunately it was slow . 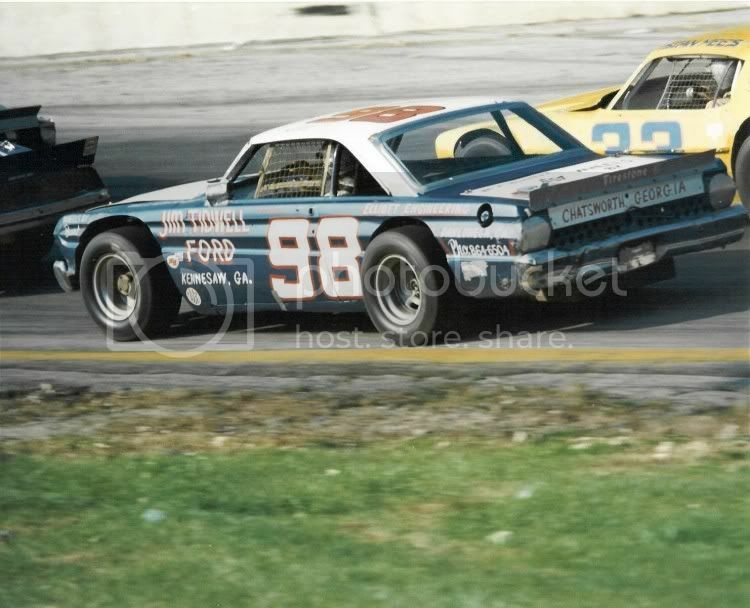 Ted Musgrave ran this Mustang all over the country including Cayuga but it never worked very well . Merrifield loved Dodges but he also had an a infinity for automatic transmissions for several years , they both held him back . Harvey Walsh was a genius and years before people realized it was all power to weight he had figured it out . Harveys cars were light and fast . At the time the Ford guys were using the 312 boat anchor engine and Harvey went to the new 289 . Check out the small light weight tubing on the car many years before others realized that cars should not look like tanks . 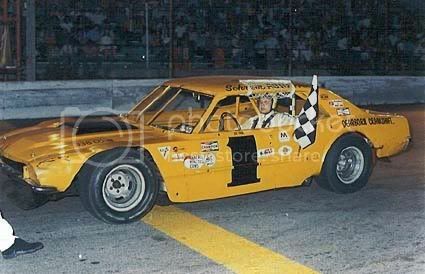 Bruce Vandyke was a great fabricator and a good driver . His cars were always fast . The opinions expressed here are mine and not necessarily those of CRO or its other members , but should be . great photos-thanks for posting. I remember Joy Fair rebodied the Stang with a 4 Door Maverick body at one time-strange looking car, but I guess the body was free. As a Ford Torino and Mustang owner I say thanks pc. It has always been a small group of us who stay loyal to the Blue Oval in local racing. With Micks and Ranger both having successful NCATS season last year , we had something to be proud of. Recent years saw Jason Shaw in the # 84 Mustang in Alstar and of course Jr Hanley in the Quaker State T Bird # 72. I still have a Quaker State hat that Jr gave me in the pits in Barrie in the mid 90's I think.
" It's not the sentiment of men that create history, it's their actions". 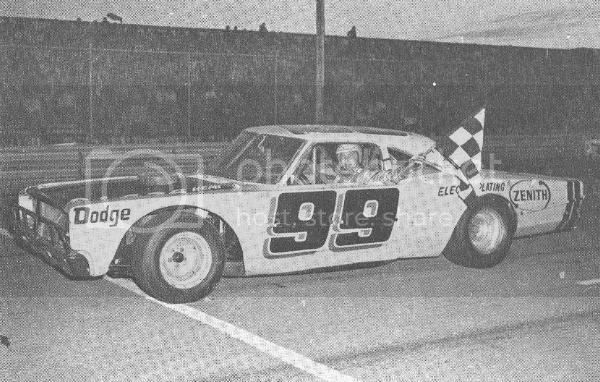 The last year Cayuga ran weekly Friday nights there was a Javelin #13 called the "Box Car", it was emerald green, gold and black, I think Terry Kitchen drove, i maybe wrong. That car had too start last every race and was leading in 3 or 4 laps. The most dominant car I saw in a class. I was looking thru my archives for a pic out of the old program, but it must be in the garage with 4 containers of old "Stock Car" Magazines. Looking in my basement I did come across my old 1987 rule book that Barrie and Varney shared, which i thought was funny now. Other programs from the 80's of non chevies winning.... "The Great Lipskie" and Andy Schmidt...Nov. 85 Circle Track mag cover features Junior Hanley ASA T- Bird at Oswego...and other mag with Hooters Super t-bird of Alan "special K" Kiwicki. Plus u could mention a number ford hobby drivers. 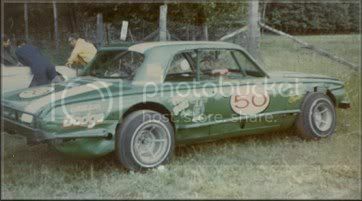 My first stock car in 78 was a 1967 Comet 302 automatic I paid $150. for. Had no clue, just wanted to race. The cage was made of 2 1/2 inch pipe, car weighed a ton, me and the other ford racing, a 67 galaxie, fought for last every week, i tried to keep count of how many times don thomson jr. would lap me, one night i could hear voices and then music....here they didnt even pull out the radio, just sheet metalled over it....made for a good few weeks of kidding..."Hey, are u the guy listening to the radio racing?" 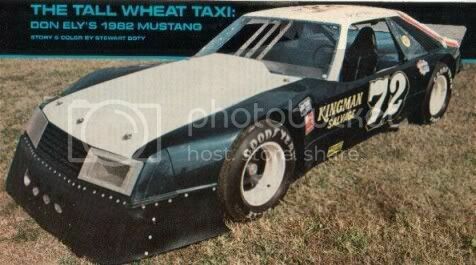 and that #75 looks like the dodge street stock dirt car for sale on kijiji.ca now. I'd be all over that. I'd be more likely to win the 6/49 first. Then I went up and looked at the #75 car, it's a Phord. Speaking of Joys Marverick here it is , i think this is at Flat Rock . 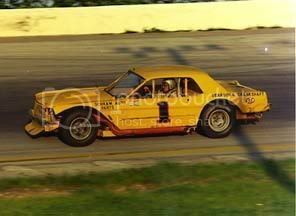 Joe Ruttman drove it this night because Joy was injured . Hanleys Mustamaro or Camarostang or what ever you want to call it at Nashville . Larry Detjens Dodge Challanger at Mt Clements . I dont think this was a kit car but it was really fast. 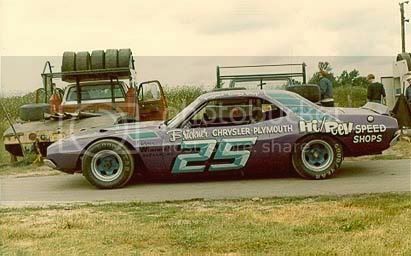 One of the Thunder Car drivers at Barrie runs a true Chrysler product, it is a Magnum nose on a Diplomat (IIRC)with a pretty stout 340. Darcy Gribbon, the red #25. I would love to run a straight torsion bar Mopar, but good luck finding one today that isn't totally rotten or worth big money. The "J" bar later Mopars aren't as good for Stock Cars IMHO. Thunder6 i have seen Kit Cars skinned in all the different bodies but several people built their own version and i think Larry Detjens was their own design . 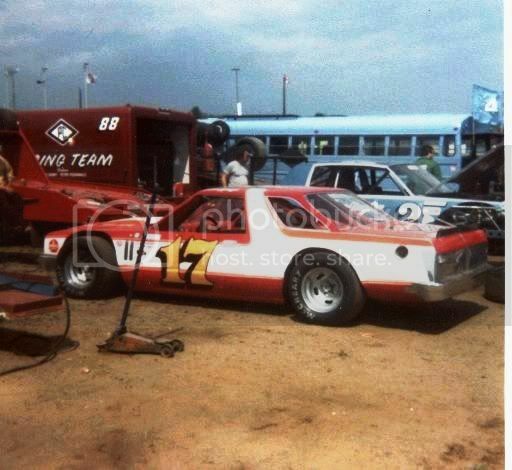 There was one owned by a Garage in Burlington i think their name was Hall and Smith that was Electric Lime Green and i think it was # 16 that ran at Flamboro . They had several drivers in it including Terry Kitchen but they could never get the thing to stop pushing. "2nd place is just the first loser"
Page created in 0.253 seconds with 33 queries.